The site of the 17th Street Farmers' Market has been a public gathering place since 1737, and is one of America’s oldest public markets. 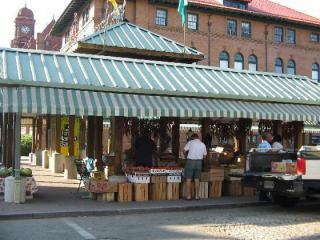 The Farmers’ Market in downtown Richmond has always been at the intersection of local commerce for two reasons—the proximity to the river and the fact that Main Street served as the main road between Richmond and Williamsburg and nearby Shockoe Creek was used by small boats bringing shellfish to awaiting customers. Support the 17th Street Farmers' Market for access to the freshest, best-tasting and most nutritious produce, eggs, meats, cheeses, baked goods and other prepared foods as well as locally handmade crafts. Hours: Thursday Growers’ Market, 10am-7pm; Friday Red, White, & Brew Market, 5pm-9pm; Saturday Growers’ Market, 10am-4pm; Sunday Vintage Market, 9am-4pm.